I have to admit, I’m more interested in the presidents and other historical or political figures after their terms are served. This year, I know virtually nothing about the vice presidential candidates. Google told me that Tim Kaine is known for his expressive eyebrows. A few months ago, a podcast told me that Mike Pence is know for, among other things, some controversial legislation that has to do with women’s bodies. Mike Pence is a politician with strong anti-abortion convictions. He signed into law House Bill 1337. This law “Provides that a miscarried or aborted fetus must be interred or cremated by a facility having possession of the remains. Requires a person or facility having possession of a miscarried or aborted fetus to ensure that the miscarried fetus or aborted fetus is preserved until final disposition occurs.” This is the language that caused some Indiana women to contact Pence’s office detailing very personal information. As some miscarriages happen before a woman knows that she has been pregnant, women began to contact Pence’s office describing the detail of their menstrual flow and asking whether they needed to inter or cremate the contents. This popsicle references these events. This popsicle has a coconut milk base which is sweetened with agave syrup. There are also cherry preserves, and homemade chocolate sauce in this popsicle. The white of the coconut milk represents the white of a toilet bowl or a maxi pad. The add-ins, with their mix of red and brown represent menstrual biological material. So often, conversations about medical issues focus on philosophy. 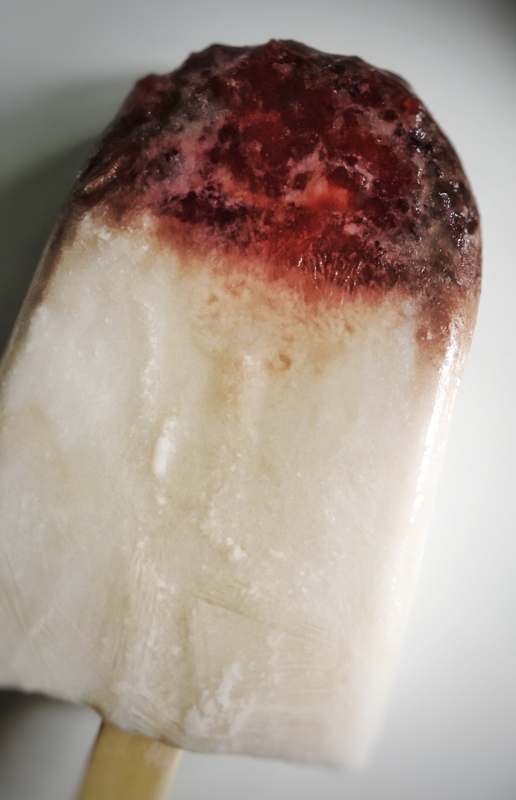 This popsicle, no matter your position on the involved issues, encourages you to think about the flesh and blood lives attached to these issues. This entry was posted in Election 2016 and tagged cherry preserves, chocolate sauce, coconut milk, election 2016, Mike Pence, popsicle, vice president. Bookmark the permalink.